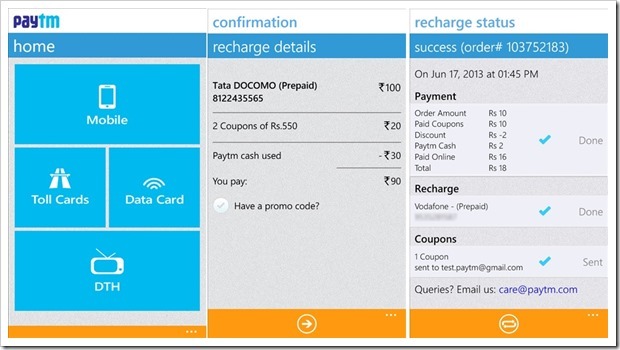 Paytm, India’s leading destination for mobile pre-paid recharge and utility bill payments service announced launch of their mobile app for Nokia Lumia and Windows phone platform as well as for Nokia Asha Touch Phones. With this launch, Paytm App is now available on nearly all the smartphone platform stores including Android play store, iOS app store, Blackberry app world, Windows phone as well Nokia store. Paytm is already one of the most downloaded utility mobile apps in India notching up over 1 million downloads on Android. According to their website, 6.5 million people have used Paytm over 70 million times via various channels including web, sms, IVR, mobile site and mobile apps. The newly launched app on Windows Phone allows mobile users to do mobile recharges, toll card payments, data card recharges as well as DTH service recharge. App for Nokia Asha Touch phones which is available on Nokia store also has all four services enabled. In march of this year, Paytm had launched Bus ticket bookings to go with mobile recharge and mobile payments on their web platform. This new feature was added to Paytm Android and iOS apps in May so that consumers could book bus tickets on their mobile apps as well. Currently, bus tickets are not enabled on Windows and Nokia Asha apps. One of the reason why Paytm has been quite successful is due to mobile apps’ intuitive user experience. Paytm has been getting rave reviews for their easy-to-use UI of the apps, that mobile app users love. Another reason for apps like Paytm to be successful is because they big on incentives. When a user does a recharge with Paytm they are offered various incentives like coupons of various e-commerce sites, or gift vouchers. These incentives are offered even on the smallest of recharge amounts, which makes it quite appealing to all kinds of buyers. Wireless Charging: Really Useful or Just A Fad? TRAI Announces Much Needed VAS Activation & De-Activation Procedures! Now, Recharge Your Reliance Jio Number With Paytm! Vodafone Private Recharge Mode Allows You to Recharge Without Disclosing Your Number! wow this is really cool .